Back to Home Back to News & Tour Back to Tour news Back to 2018 Back to February Back to Slow play: Do we need a better system? Slow play: Do we need a better system? Slow play has been long been a big topic of conversation on Tour, but with incidents occuring more frequently and no penalties being handed out, do we need a better system? Paul Lawrie has always been a hugely outspoken figure on the topic, and the Scot took to twitter to debate the topic yet again as he called out slower players for 'cheating the system'. Lawrie even went so far as to name two players he's been grouped with the past two events he's played in on the European Tour, saying that both youngsters Aaron Rai and Max Keiffer were part of a group of players that play "as slow as they want until referee comes then hit it on the run to make sure they don't get penalised then as soon as ref gone its back to taking forever again." While it is perhaps in bad taste from Lawrie to name players, slow play has become endemic on both tours. In the last few weeks both JB Holmes and Webb Simpson have been the central topic of the slow play debate on the PGA Tour. JB Holmes spent over 4 minutes debating what to hit for his second shot on the par-five 18th hole at Torrey Pines, making playing partner and leader Alex Noren wait in the wings in what was described by several as an 'icing'. Holmes needed an eagle, but opted to lay up and would card a birdie - not enough to force himself in to the play-off with Noren and Day. Several players were particular vocal on social media about Holme's display, with Luke Donald and Daniel Berger chastising both the lack of input from Tour officials and the bad reputation slower players give the rest of the competitors in the professional game. There were of course defenders of Holmes, and he himself said he didn't know what the big deal was about. "I didn't realize how long it was taking," Holmes said. "We were just trying to make the best decision to play. I don't understand what the big hoopla is all about. I was just trying to give myself the best chance to win the tournament." And it's not just Holmes. 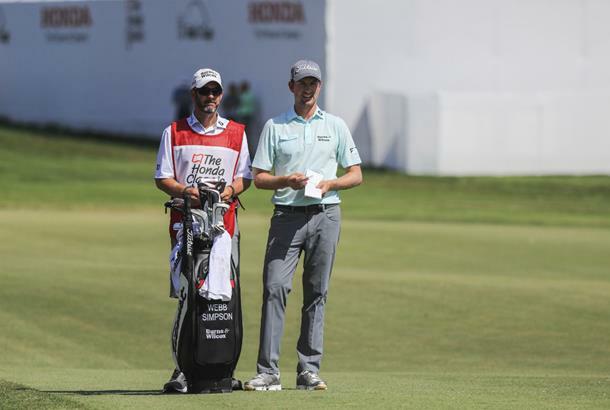 As recently as during the Honda Classic on Sunday, Webb Simpson was hailed as 'selfish' by Sky Sports' on-course reporter Wayne Riley, who he said was the main cause of their group (himself and Tommy Fleetwood) being over a hole behind. One incident in particular occured on the 13th fairway, where he took more than double the allotted time (40s) given to hit a shot, down to a lengthy discussion with his caddie, backing off while over the ball and changing his mind on club selection. An official arrived on the 14th tee to move the group along, but it was Fleetwood who went on to suffer, relinquishing his spot at the top of the leaderboard with a three-putt double bogey. And these haven't been the only incidents this year. At the Genesis Open both Patrick Cantlay and Kevin Na were in the firing line for stretching the time acceptable to play a shot, and the resulting slow play of the field caused play to be suspended due to darkness on the opening two rounds. So is it time for a better system? In theory it's a good idea, but it would mean a lot more resources as it would require timing players for every shot. Fellow major champion Ian Woosnam suggested that the scorers (who volunteer at tournaments) could also time, but while that sounds like an easy solution, it's a big responsibility for a volunteer if they go from counting shots to potentially costing players shots with their stop watch. While the PGA Tour has endured the brunt of recent slow-play controversies, it's the European Tour who are taking the first steps in order to combat the problem. They debuted the '40 second count-down shot clock' on one hole at Golf Sixes last year, and are going to roll this idea out to a full tournament when they head to Austria for the Shot Clock Masters in June. It's a concept we're looking forward to seeing in action, but whether a shot-clock on tour is a conceivable thing to have at every tournament is yet to be seen. We'd prefer it wasn't necessary at all, but it's evident something needs to be done.